Gardening with kids is a great way to get them thinking about how food is grown. There are thrills to be found in the process of growing something edible, and kids are often especially fascinated by the seed-to-plant transformation. Kids will feel a sense of pride when their gardening efforts pay off. As a result, they may even feel more excited about eating the fruits -- and veggies -- of their labor. Interested in helping your child learn to garden? These tips may be a good place to start. The experts at KidsGardening.org call gardens “living laboratories.” Indeed, the gardening process is rife with opportunities for learning and growth (pun intended). Exposing kids to different kinds of vegetables is one such opportunity for growth. When it comes to eating vegetables, kids may be a little more open-minded if they’ve grown it themselves. In addition to growing the old classics (green beans, peas, and carrots), KidsGardening.org suggests incorporating a few vegetables that kids are less familiar with, such as leeks, okra, or kohlrabi. 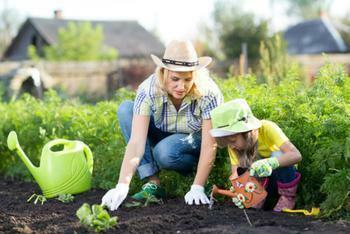 Parents may also want to improve chances for gardening success by opting for easier-to-grow vegetables. Gardening success can help bolster kids' confidence and instill a lasting sense of pride. Some easy-to-grow veggies include radishes, carrots, and lettuce. Patience isn’t a quality that most kids come pre-loaded with right out of the gate; it’s a trait that must be fostered. Gardening can help preschool-aged kids practice patience and hone their sense of time. Using a calendar, parents can lay out a general timeline of events for kids' gardens. Parents.com suggests highlighting important days, such as when seeds should germinate or when kids will need to water or weed. Stickers or check marks can be used to denote days when gardening duties were accomplished. Before starting a garden with your child, it’s important for parents to be sure the site is safe for kids. Performing a soil test is one way to learn more about the site of your garden. Contaminants such as lead and other heavy metals are often lurking in urban soil, but suburban soil may contain lead paint residues, pesticides, or even car exhaust drift. For information on soil testing, contact your local extension service. In addition, parents will want to be sure animal visitors are kept out of kids' gardens. Rabbits, deer, and other creatures could leave behind pathogen-filled waste. To keep out rabbits and smaller rodents, a low wire mesh fence should do the trick -- but because they tunnel, be sure the fence extends to at least six inches underground.